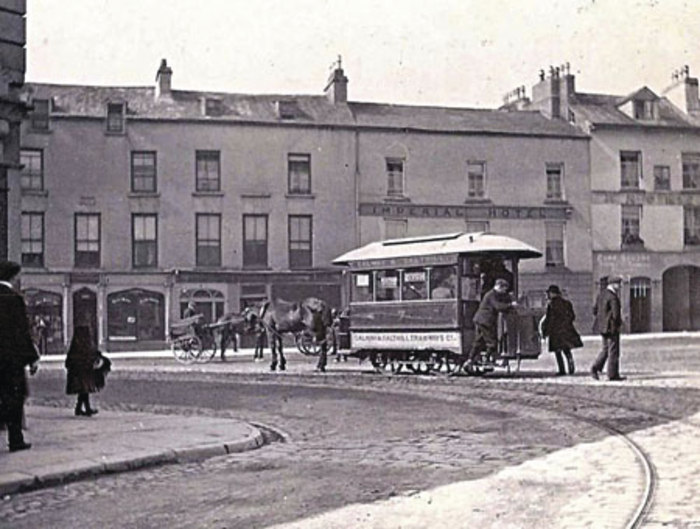 This photograph of a single-deck horse drawn tram was taken in Eyre Square c1900. The American style dome roof top cover provided cover for passengers during the winter. In one of their books, Somerville and Ross described these vehicles thus: “The little one-horse trams glide along the shining desolate road like white-backed beetles.” This tram was painted in a battleship grey colour. The double-deck open summer trams, which needed two horses to pull them, were painted in olive-green and white. Our tram carries the company name “Galway and Salthill Tramways Company” on the side and a number of advertisements on the windows. The company was incorporated in 1876, parliament authorised the line in 1877, and work began on construction in 1879. It cost £15,590 to build. The depot was in Forster Street and the line ran from there around two sides of Eyre Square through William Street, Mainguard Street, Dominick Street, Sea Road, Nile Lodge, and on as far as the Eglinton Hotel. The single tramline was two and a quarter miles long with eight passing loops, roughly 250 yards apart. The rails were steel, a heavy type for horse traction, and the gauge was three feet wide. The track was mostly level but an additional horse was stationed at the bottom of Kingshill to assist with the steep gradient there. The line was opened on October 1 1879. The company had five double-deck trams and the system was one of the most advanced in Europe at the time. The company began to experience financial difficulties before World War I, and when the British army commandeered most of its horses to serve in Flanders, that signalled the end of the company, which closed in 1919. This created an opportunity for a new motorised transport company, and so the Galway General Omnibus Company was established that same year. It ran a bus service of 15 minutes’ frequency between Eyre Square and Salthill, and in its first year, recorded a profit of £634. It provided an excellent service and added new routes, but all of this came under threat in 1930 when the country’s largest railway company, Great Southern Railways, began to complain that road transport companies enjoyed unfair advantages in their tax treatment and freedom of operation. It wanted to eliminate wasteful competition. The fate of the private bus operators was sealed by the Road Traffic Act 1933, and eventually, in 1936, GSR took over the Galway Omnibus Company’s licences. The shop we see on the left in the background was JJ Ward’s where he sold bicycles and accessories. Next to that was Gilbey’s, then the Imperial Hotel, PM Holland’s outfitting establishment, and an archway, which can be seen on the right, through which was a public right of way down to Eglinton Street. All of the above comes from a new book entitled The Story of the Galway General Omnibus Company Limited which is compiled by Michael J Hurley. It is a very well illustrated account of the company from 1919 to 1936 which carries an account of the tramways by way of introduction. Highly recommended at €12 from good bookshops. Page generated in 0.0979 seconds.